The Stories format has given news organisations a new way of connecting with audiences. Some publishers use it to tease their content outside of the app, some give audiences a 'behind the scenes' look into the workings of their newsroom, and others prefer to use the space to present polished news coverage, produced for the platform. In its latest update, Instagram has announced a twist on private sharing, enabling users of the platform to post Stories to a limited group of followers. It is thought that 'Close Friends' will encourage the everyday user to post more personal content, that they might not wish to share with all their followers, meaning more content will be posted to the platform. Will this feature be of use to news organisations? Only time will tell, but with publishers increasingly giving some audiences access to certain content over others in the form of VIP newsletters, paywalls or daily updates, we might suspect for them to use this feature in the future. Upload a piece of content to your Instagram Stories or take an image within the app. Once you are ready to publish, tap the green star icon at the bottom of the screen to open your 'Close Friends' list. The app will list your followers, suggesting friends to you based on the people you interact with most, or you can use a search box to finish your list. Tap 'Add' next to the names of the people you would like to make up your exclusive list. Note that this is amendable each time you post a new piece of content to your Instagram Stories, so you can change your mind at any point. Once you have made your list, you will be able to share to your close friends by tapping the green circle whenever you capture a photo or video for Stories. Those on your 'Close Friends' list will see a green ring around your Story in the tray at the top of the feed — a visual signal that a close friend has shared something more privately with you standing out from the standard pink-purple gradient rings. However, friends are not notified if they are removed or added to your 'Close Friends' list, and cannot request access. 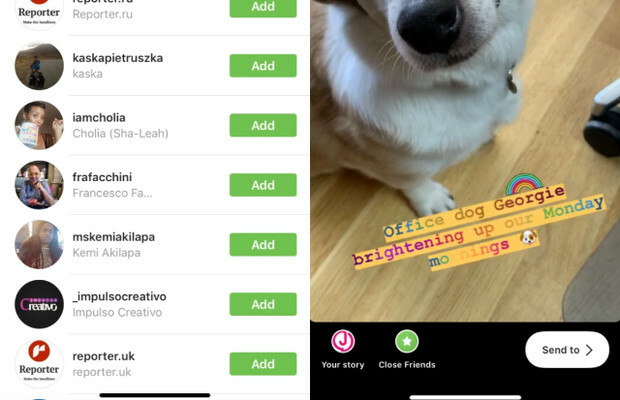 Let us know if your news organisation decides to use the 'Close Friends' list on Instagram Stories — we would love to know how it is helping you connect with audiences.